St. Kassiane the Hymnographer was born between 805 and 810 in Constantinople into a wealthy family and grew to be exceptionally beautiful and intelligent. Three Byzantine chroniclers claim that she was a participant in the "bride show" (the means by which Byzantine princes/emperors sometimes chose a bride, giving a golden apple to his choice) organized for the young bachelor-emperor Theophilos. Smitten by Kassiane's beauty, the young emperor approached her and said: "Through a woman came forth the baser things," referring to the sin and suffering coming as a result of Eve's transgression. Kassiane promptly responded by saying: "And through a woman came forth the better things," referring to the hope of salvation resulting from the Incarnation through the Most Holy Theotokos. His pride wounded by Kassiane's rebuttal, Theophilos haughtily passed her by and chose another to be his wife. We next hear of Kassiane in 843 when it is recorded that she founded a convent in Constantinople, becoming its first abbess and devoting her life to asceticism and the composing of liturgical poetry. The best known of her compositions is the Doxastikon on the Aposticha of the Bridegroom Orthros for Great and Holy Wednesday (which service is, in parish churches, chanted by anticipation on the previous evening). Tradition says that in his later years the Emperor Theophilos, still in love with Kassiane, wished to see her one last time before he died, so he rode to the monastery where she resided. Kassiane was alone in her cell, writing her now famous hymn, when she realized that the commotion she heard was because the imperial retinue had arrived. Being now devoted to God in her monastic life, Kassiane fled from her cell and hid, leaving the unfinished hymn on her writing desk. Theophilos was directed to her cell and entered it alone. Not finding Kassiane, he turned to leave when he noticed papers on the desk and read what was written upon them. When he was done reading, he sat and added one line to the hymn; then he left - never to see Kassiane again. The line attributed to the Emperor is "those feet whose sound Eve heard at dusk in Paradise and hid herself for fear." 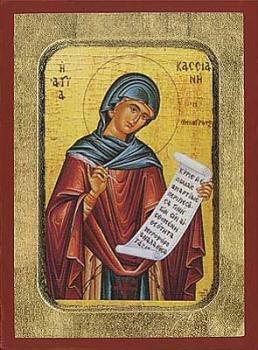 When the emperor and his party departed from the monastery, St Kassiane returned to her cell, discovered what Theophilos had written, and finished the hymn now popularly known as "The Hymn of the Sinful Woman."